Up above the sightscreen, the perched Sky cameraman was going through his pre-match exercises, measuring his swoops, judging his angles. Below him Gloucestershire, dressed in training gear that made them appear to be an Australian Rules football side were getting into a similarly preparatory regime. 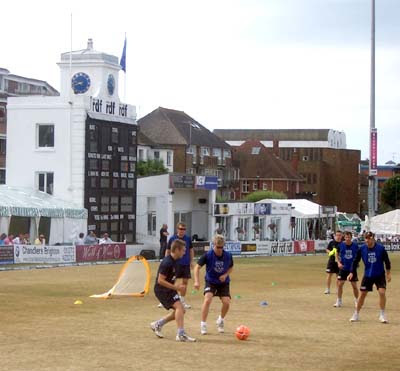 Closer by, Sussex, like many modern cricket teams, began their day by playing another sport entirely, kicking around a football between two goal nets that looked like slightly enlarged pyramid tea bags. After finishing with this, they got to work individually with elasticated bits of gear that appear to be a cross between a bull-worker and a featureless Stretch Armstrong doll. Whatever it was, it made them look like a conference of pizza chefs enthusiastically pulling the air pockets out of their dough. One row ahead of my seat, a boisterous ménage of young people fond of their verbal volume speculated brashly on whether they could move their seats to the boundary edge and move the wheelie-bin in their current place. Slap bang in front of me. Fond as I am of watching wasps circling in the hope of a rogue chip, I was grateful when they suddenly realised that beneath the hat and newspaper to their immediate rear was an actual human being hoping not to have to compete with winged insects for the premium view. Once settled they then asked me to “do the honours” in looking after their bags whilst they hunted down the day’s first beer. This currently being 09:45 on a Sunday morning. I should have had the foresight to say that this was fine, but on the understanding that they would not return with several of those inflatable clapper dealies. Sadly, such a caveat was not in place prior to their brief departure. Thus, I rued. Thankfully, I rued not for long as they decided to deal with their, err, bindecision by moving somewhere else entirely, whilst a quiet and inflatable-clapper-less elderly couple took their seats. Sod this semi-final lark, today’s first result had been achieved. Despite the day’s powerful heat, Sussex had managed to groom someone into taking on mascot duties. Thus, some fella in a shark costume was able to linger about at the toss like an ostentatiously dressed elevator fart. On the face of it Sid the Shark appears to be the most benign of killers, his mush having been stitched into a wide rictus toothy smile. That said, as he passed along the boundary later, he attempted to get one old boy’s attention by repeatedly slamming down the lid on the very same wheelie-bin which has already taken a starring role in this write up. After being ignored by the elderly gent, Sid tapped his temple twice before slowly drawing his thumb across his throat. Clearly, in Sussex, they prefer their mascots to be more Texas Chainsaw than Mallett's Mallet. Gloucestershire captain Alex Gidman won the toss and chose to field. However, Ed Joyce appeared in no mood to let Gidman delight in his coin-based good fortune, hitting boundaries early and often. 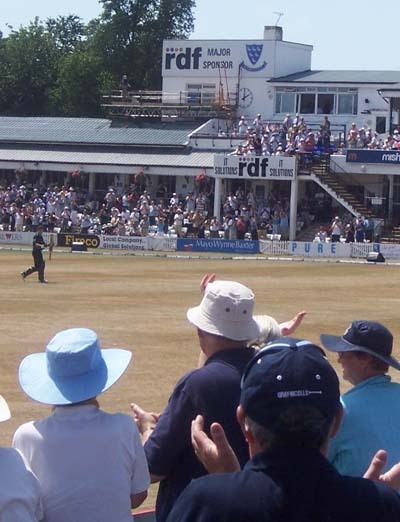 However, it appeared to be far too early on a Sunday morning for the Sussex crowd to start flinging about the 4/6 signs the sponsors always hand out when the telly is in. New Zealander James Franklin was having a particularly torrid time, going for five boundaries in his first eight deliveries, yet being removed from the attack after a much improved third over from which only two came. When he was brought back, from the other end, his next three overs were hit for 30. Fielding down at fine leg a little later, he could only smile wryly as a Sussex wag shouted out “C’mon Franklin. We want 400, get back on, old boy.” “Bowl ‘im from both ends” added another. Mind you, whatever Gloucestershire tried, apart from some good early line and length stuff from Steve Kirby, nothing seemed to work, not even the puppy faced England international Jon Lewis, rolling in with his hair bobbing like the ears of a King Charles spaniel. Sussex just had too much quality up top, whether it was Ed Joyce, looking like a landfill indie-band’s irregular touring keyboardist, hitter of the game’s three sixes and adept strike rotator; the squat Murray Goodwin, cutting adroitly and sticking out his rear in a stance that made him look like the kind of modern R n’ B rumpshaker Sir Mix-A-Lot would have approved of; or Luke Wright, his spiky hair and hospitable features meaning a career presenting links on CBeebies surely awaits, knocking 6 fours in an early cameo. It was a Twenty20 performance sustained almost throughout and, initially, Gloucestershire looked like they could keep up, with Hamish Marshall and Gidman both scoring quickly. In the seats near me, a bright-pink-faced away supporter was imbibing his umpteenth cider of the day and repeatedly yelling “C’mon Glooooooooooooooucsssssssss” with an accent so warmly coarse, you could have shorn a sheep with it. However with a long tail (well, if they’re sending out James Franklin at six, it suggests a new Don Bradman is unlikely to follow), once Chris Taylor had his middle stump torn out by the impressive Yasir Arafat during a brilliant spell of controlled bowling, all seemed lost for our be-lobstered Glooooooooooooooucsssssssss fan. Gidman hung around for a while longer, but after he was caught by the wicketkeeper Andrew Hodd from Michael Yardy’s nibbly left-armers, the game really was up despite, to be fair to him, a dogged 34 from Franklin. Up until that catch, and his deft stumpings of Steve Adshead and Vikram Banerjee to finish the game, Hodd had been doing his best to help Gloucestershire along, allowing 11 byes past and turning the odd wide ball into a few extra runs. He’ll be grateful that the game wasn’t tighter than it was. 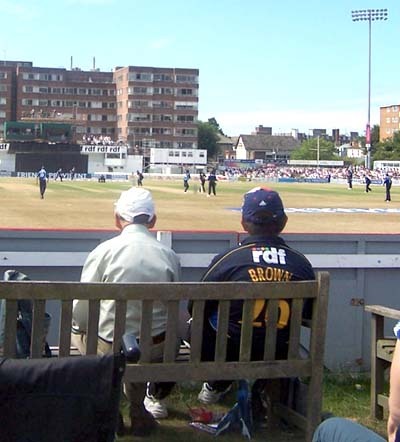 Sussex move on to Lords where they will meet Hampshire for a south coast derby that will be even more keenly fought than your average Trophy final. However, given Hampshire have only ever lost the one Lords final, and that was the one I attended, I shall be giving it a wide berth for the greater good. Yet it is clear the summer Hawks will have to be at their best to beat Sussex on this form. From our point of view it was a great day out ... apart from the result!! Must have missed you on our tween-innings' break circumambulation of the ground! Anyway, I expect our boys decided they'd rather have a day off next Saturday after six consecutive days' cricket at Cheltenham ... we'd never have done justice to a Lord's final! Where were you sat Karen? Didn't even think about the Bristol branch turning out! Glad you had a good day despite it all. Just out of shot to the right of the beer bus in your second pic. Trying to avoid some of the more raucous 'shire element: we may not have noticed the proximity of the beer bus when we first selected our seats!